This hilarious digital print has panels of cute farm animals having fun! Treadlette Melissa took the Farmyard Buddies print and made this adorable pillow. It's a real conversation starter! This amazing, full-width cotton panel print features Gustav Klimt's painting, The Kiss. Rich amber and yellow tones make this a sea of gold, and like the original painting, the print is subtly metallic. The entire panel is printed in exquisite detail! This print would make a perfect center for a masterpiece quilt. Add borders and go! New Indian imports from Wool Gathering Co.! These deep indigo-blue cottons are dreamy and light as air. Make the perfect spring blouse, or a skirt that floats in the breeze. Many of them have border prints, so you've got extra design elements to play around with! New Rayon Prints For Spring! These gorgeous new rayon challis prints are the soft, drapey fabric of your dreams! Easy to wear, easy to care for, and always flattering, never bulky. Add some to your wardrobe in flowing blouses, dresses, skirts, and scarves. These soft shirtings would make ideal layers for these last weeks of winter and will seamlessly transition you into spring. Subtle plaids, stripes, and woven dots are gender-neutral and never go out of style. Shop our Winter Sale! Thursday Feb 22 - Wednesday Feb 28! 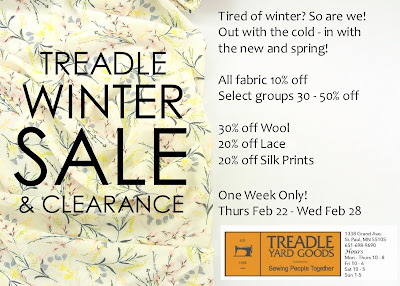 Great last-chance deals on fabulous winter fabrics! First look at new arrivals for Spring! New patterns and colors in our luscious silk and rayon blend velvet! We have some delicious new imports from our friends at Wool Gathering Co. First up, let's take a look at these stunning ikat cottons! You may have met Material Girls Debbie and Kristin at a class, or at Fashion Sewing Club. These ladies teach at Treadle, and they really know their stuff! Their specialties include sergers, sewing with knits, and fashion sewing for all ages! Debbie and Kristin love exploring modern styles and new trends. They always know the latest designer patterns, like Marcy and Katherine Tilton's artful designs, or fresh new looks from independent pattern companies like Jalie. You can catch the Material Girls' Basic Sergery class at Treadle, expand your wardrobe with Sew For Your Life, or join them for Fashion Sewing Club - every second Tuesday and Saturday of the month. See dates and times for the club here, or visit our classes page for our full class schedule. These new cotton canvas prints from Art Gallery feature the gorgeous prints we love, but in a thicker, sturdier fabric. Perfect for bags and jackets! These lovely new 100% Organic Cotton broadcloth prints are perfect for all kinds of sewing: quilting, simple apparel, and crafts. Feel good about making an eco-friendly choice without sacrificing style! Treadlette Julia made this gorgeous tunic out of one of our fabulous printed sweater knits. Julia used New Look 6415, with one modification. Wondering where the cowl is? Julia improvised it! She took the neckband pattern piece and increased its width by several inches, then added just a little extra length to make it drape nicely. The extra length got eased into the body and all that width makes a fabulous cowl collar! We are definitely in love with these two coordinating owl prints! Sometimes you want more than plain old jersey! These chevron-striped knits in black or navy will add a little zing to your wardrobe, without being overwhelming. Add a little accent or make a whole garment! These new plaid shirtings are soft to the touch, but they aren't flannel! Smoothly woven cotton twill makes these ideal shirtings. Their soft drape and slightly thicker weight means you'll be warm and cozy in this cold weather.